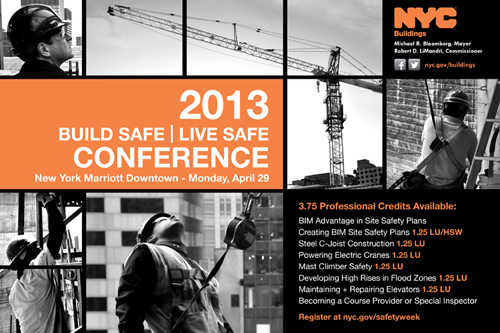 Construction safety week starts on April 29th and the New York Department of Buildings will host the 2013 Build Safe | Live Safe Conference at the New York Marriott Downtown in Lower Manhattan. During this conference participants will get an overview of recent trends and future development in The New York City construction industry. They will also have the opportunity to attend construction safety courses for professional credit on the following subjects: BIM Site Safety Plans, Steel C-Joist Construction, Electric Cranes, Mast Climber, High Rises in Flood Zones and Elevator Maintenance and Repair. New York Construction Accidents have been increasing by more than 30% between 2011 and 2012.